Archbishop Ignatius Kaigama of the Catholic Diocese of Jos and The Most Rev. Dr. James Bature on Friday settled the age-Long rivalry between the Jukun and the Tiv people in Taraba and Benue States. Kaigama, a Jukun and Dr. James Bature, a Tiv priest had met in the seminary over 40 years ago and have since maintained a good friendship despite the existing tribal rivalry between their people which had resulted in series of crises. Speaking at the peace conference, Kaigama said they have decided to document their friendship experience in a book titled, ‘Tiv-Jukun Relationship: The Model of a Jukun Bishop and a Tiv Priest’ to bring their people together to for the peace and development of their area. Governor Darius Ishaku of Taraba State and his Benue State counterpart, Dr. Samuel Ortom who grace the occasion pledged their support to the peaceful coexistence between the Tiv and the Jukun initiated by the archbishop and Bature for the socio-cultural and economic development of the two tribes. Governor Samuel Ortom who thanked Bishop Kaigama and Most Rev. 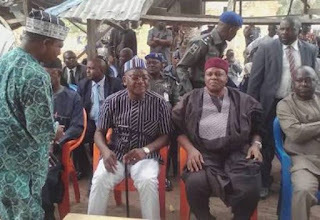 Dr Bature for using their friendship to cement the Tiv/Jukun relationship and promote peace among the people noted that there was no basis for any fight between Jukun and Tiv as the two tribes have lived together for centuries. He commended the revolution in the traditional institution in Taraba by Governor Ishaku and called for the recognition of Tivs in Taraba by giving them Chiefs as it was done in Benue for the Jukun. “We must do things that will unite our people and peace can only be sustained where there are equity, justice and fairness.